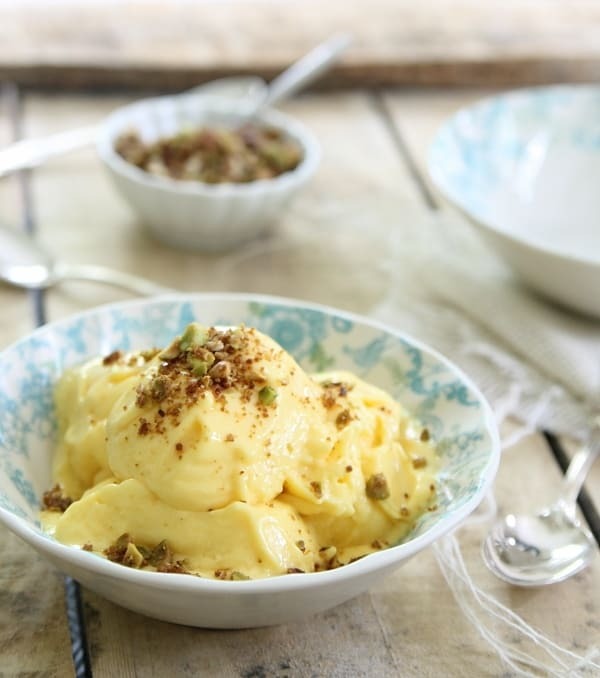 This mango frozen yogurt can be made in just 5 minutes. 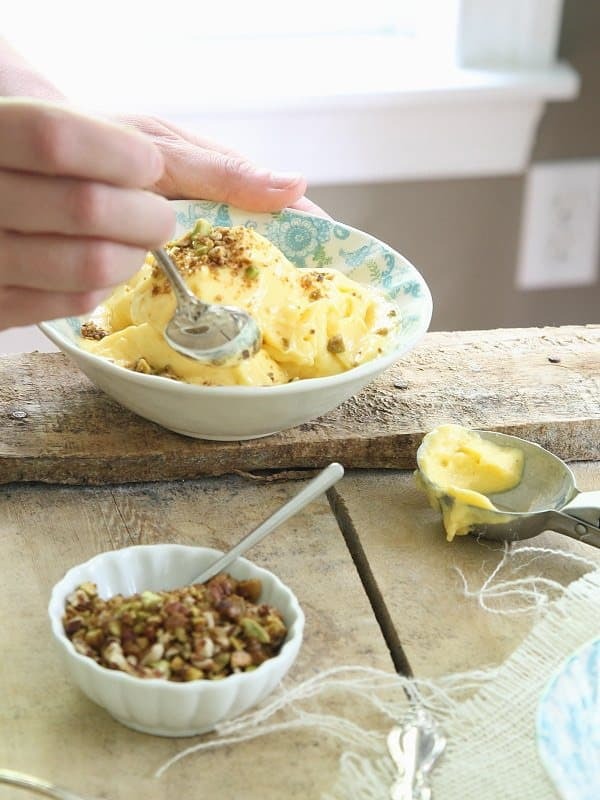 The pistachio crumble gives this sweet, creamy treat a delicious crunchy topping. Summer is all about the ice cream for me. We live 2 minutes away from a Rita’s (not my favorite icy treat, but hand me a small gelati and I won’t complain), about 7 minutes from the local hole in the wall ice cream joint (think everything from soft serve to sundaes to floats) and about 12 minutes from a self-serve fro-yo (and all it’s topping possibilities!) place. Know what all that means? 3 different, all too close by places to pack on an extra 10 pounds this summer. And when you go 2-3 times a week, yes, that can happen pretty easily. This is my last post with Udi’s and interestingly enough, it’s supposed to be about my gluten free journey. As we’ve gone over a few times, since I’m not gluten free, my journey is really one about overall health in which a gluten free diet sometimes fits into. Health this summer is going to mean finding a balance between the ice cream shop treats (because let’s be real, there’s nothing better than a cherry dipped vanilla cone in all it’s high fructose corn syrup glory) and homemade (healthier) alternatives. 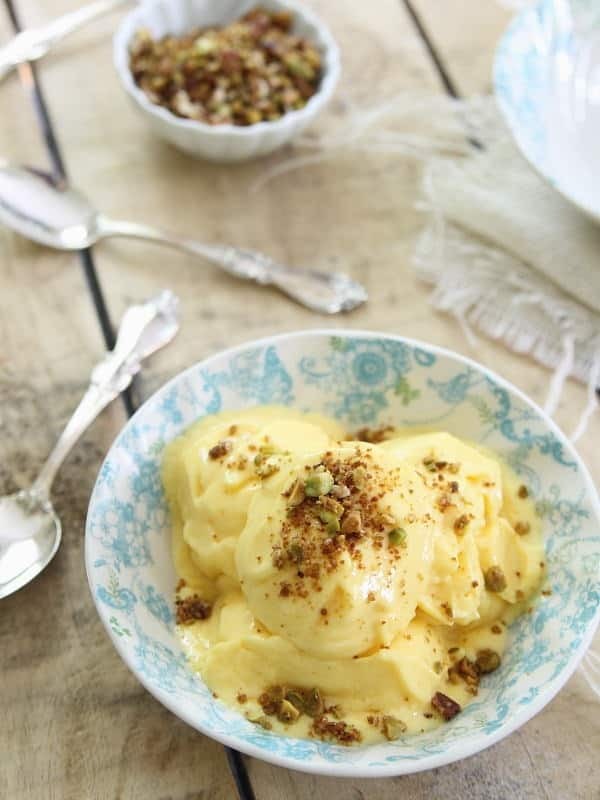 Like this mango frozen yogurt you can make in 5 minutes. No ice cream maker and no freezing required. Just some frozen fruit, yogurt and a good food processor. Process until smooth, about 3 minutes. It will be the consistency of soft serve ice cream at this point. Either serve immediately or, transfer to a freezer safe bowl and freeze until desired consistency. 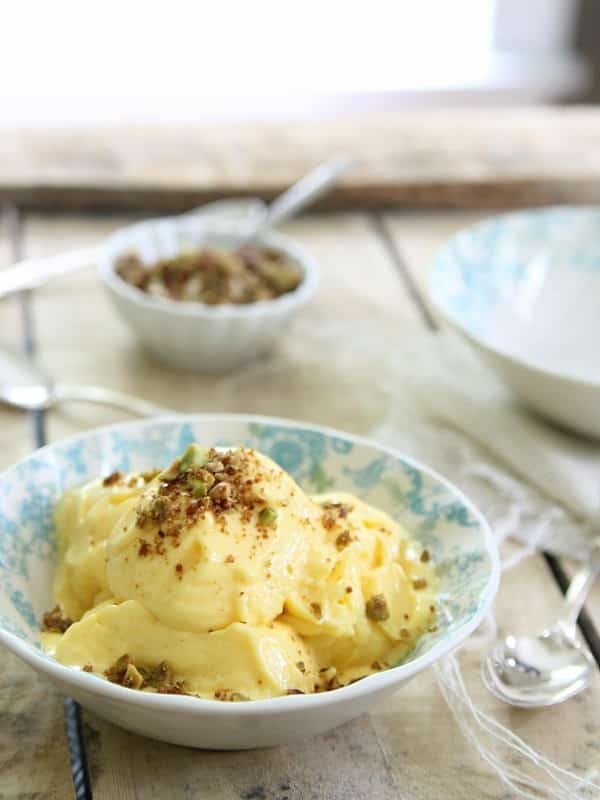 Combine all ingredients in a small bowl and work the ingredients together with your fingers so the coconut oil coats everything and a crumble texture forms. Sprinkle the crumble on top of the frozen yogurt and serve. mango is my favorite fruit, next to bananas. i can’t do cow milk well, so maybe goat milk yogurt will work as a sub? definitely need to try this out, it looks so good! Looks divine! I need me some of that Froyo! Five minutes to that deliciousness?! Wow! I love that you used mango in your recipe! This looks so delicious and is perfect for the summer! I like how it’s so quick to make! This looks easy and delicious! I swear, the simplest recipes are always the best.